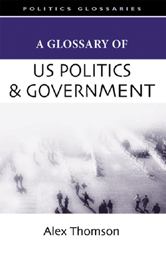 This Glossary explains the key concepts, institutions, personalities and events most commonly referred to in the teaching of US politics and government. The emphasis is on accessibility in order to provide students with a ready source of knowledge which can supplement core reading. The book will help students to address any gaps they may have in their understanding of US politics which, in turn, will make studying this fascinating subject all the more rewarding and enjoyable.